Eton Mess combines cream, meringues and fresh strawberries. 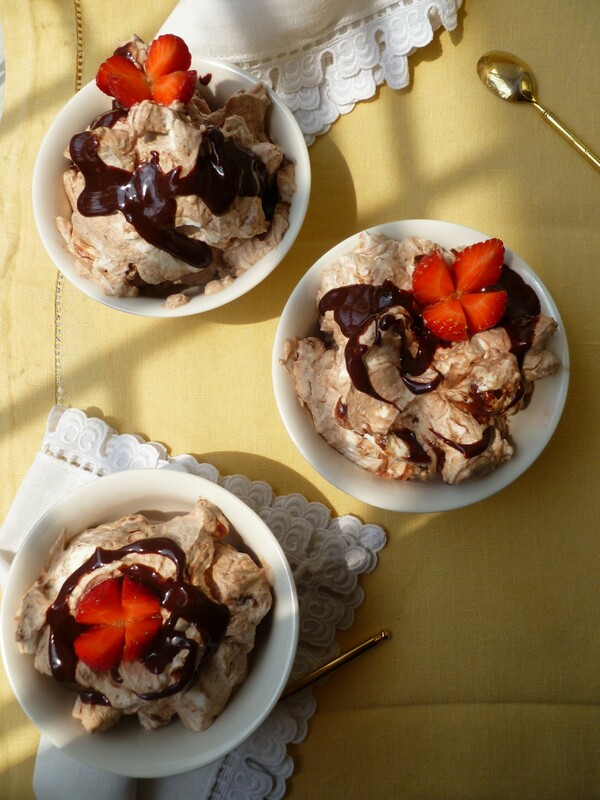 By substituting dark chocolate sauce for the strawberries, Eton Mess becomes….what? Then one spoke up from the head of the table, where he was eating the no-name dessert with every sign of enjoying it. (He is a trustworthy food critic and appreciates good desserts, especially chocolate ones.) “Cheaton Mess,” came the suggestion. Thus, a new dessert found its name. 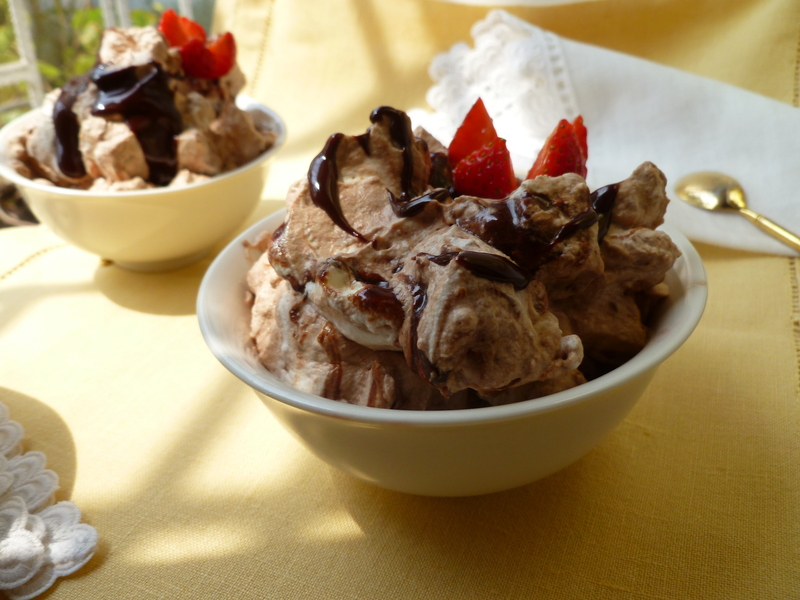 A Timing Note: The chocolate sauce and meringues may be made several days in advance. The dessert may be prepared through Step 3 several hours in advance. Complete the dessert right before serving. 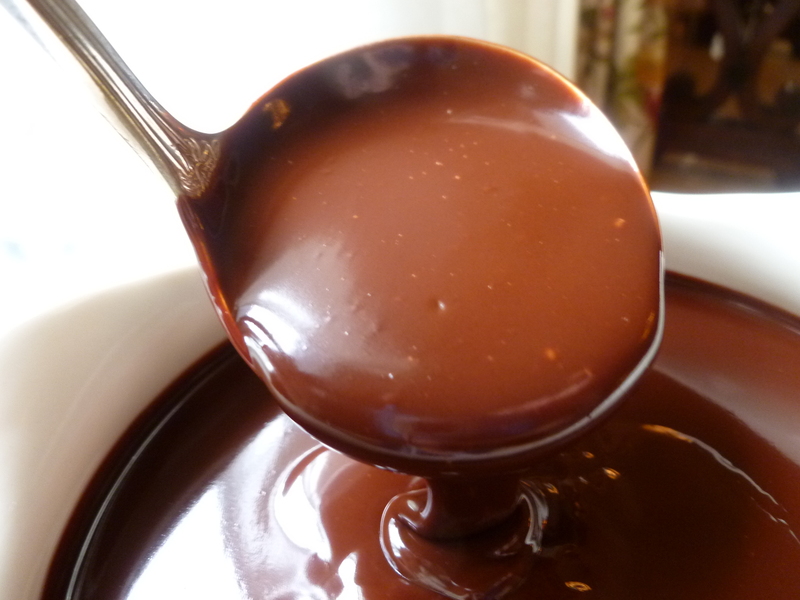 a recipe of Dark Chocolate Sauce: Instructions for making the sauce, used in a number of diplomatickitchen desserts, are repeated below in Part II for convenient reference. Any sauce not used for this dessert will keep well for many weeks in the refrigerator. 8 large Meringues (one per person) or about 5 cups of roughly crushed meringues, measured in a liquid measuring cup: The recipe, from a previous diplomatickitchen post, is given again below in Part III. 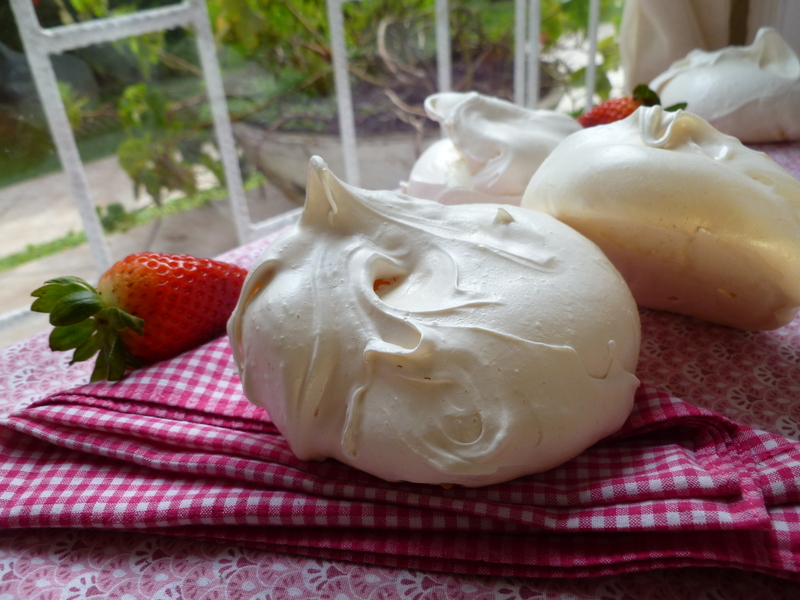 The meringues are about 3 and 1/2 inches in diameter. 2. Warm the chocolate sauce, stirring, over low heat. Cover it to keep it warm and set it aside. 4. 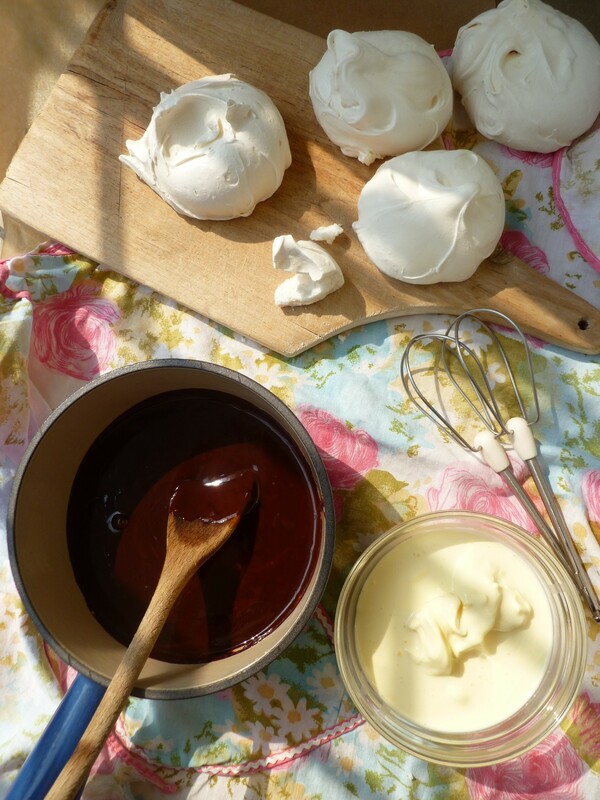 Just before serving, add about 8 Tablespoons of warm chocolate sauce to the bowl of crushed meringues and stir to roughly combine them. 5. If you are decorating the desserts with whole fresh strawberries, remove the stems, cut the berries in half or in quarters, almost all the way through, and open them out with your fingers. Set them aside. 6. Swirl about 10 Tablespoons of chocolate sauce through the whipped cream to form a streaky mixture. 7. Fold the meringues and the whipped cream together. 8. Divide the Cheaton Mess among the dessert bowls. Drizzle some more chocolate sauce over the desserts and decorate each with a strawberry. Part II: Dark Chocolate Sauce Redux: Step and finished photos are here in a previous diplomatickitchen post. 1. Add the chocolate, milk and cream to a heavy saucepan and melt the chocolate over low heat, stirring. 2. Add the frozen butter, a few pieces at a time. 3. Add the vanilla and set the sauce aside until you are ready to put the desserts together. Reheat it briefly before using it and thin it with a little more milk if you prefer a slightly thinner sauce with ice cream. Any leftover sauce keeps well refrigerated for many weeks. Part III: Homemade Meringues Redux: for about 10 large meringues, each about 3 and 1/2-inches in diameter. Step photos are here in this previous diplomatickitchen post. 1. Preheat the oven to its lowest setting. The oven in which the photographed meringues baked was set at 170 F.
2. Beat the egg whites until they are foamy. Continue to beat and add the sugar. 3. Beat until the mixture is stiff and glossy white. 4. With the ice cream scoop or a large spoon, place mounds of the meringue mixture on the baking sheet lined with parchment paper. The pictured mounds of meringue are about 1/2-cup sized. 5. Put them in the oven and bake them for about 6 hours, or until they are hard, release easily from the papered baking sheet, and sound hollow. Turn the oven off and leave them to cool in it. 6. Store the meringues in a sealed container lined with paper towels. They prefer being in a cool place. A Note: Cheaton Mess is the Dessert for the Dinner Menu: Dinner at Journey’s End.